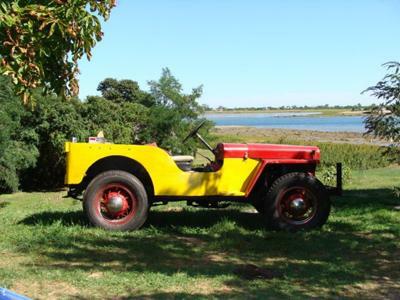 Buttercup is an unrestored but loved 1946 CJ2A. My father bought her in 1973 to use as a work truck on our family farm, which happens to be on an island in New England. We used her for twenty years and it was decided she was getting a little tired and was replaced by a John Deere tractor. After a while she was sold to a gentleman with the agreement that my father would get "right of first refusal" if she was ever put up for sale. Well, three winters ago that man kept his word and sold Buttercup back to us and she is now back on the island, going back together once again. We don't plan on restoring her, just make her better (like putting her wire wheels back on) and painting her yellow again. 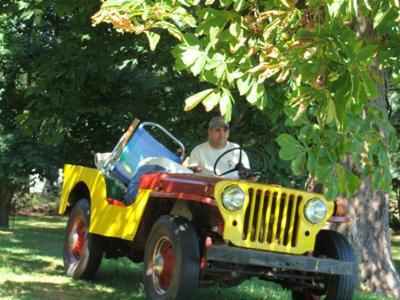 Larry's Comment: Great story William on your '46 Willys CJ2A. Question: Just curious as to where the wire wheels came from? I always wanted to put Ford wire wheels on my CJ2A, but never seemed to find 4 of them. Thanks for sharing!